Usability for the Web tells you how to design usable web sites in a systematic process applicable to almost any business need. You get practical advice on managing the project and incorporating usability principles from the project's inception. This systematic usability process for web design has been developed by the authors and proven again and again in their own successful businesses. Examines the entire spectrum of usability issues, including architecture, navigation, graphical presentation, and page structure. 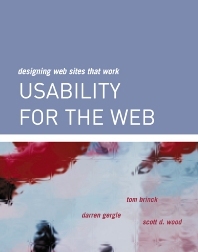 Explains clearly the steps relevant to incorporating usability into every stage of the web development process, from requirements to tasks analysis, prototyping and mockups, to user testing, revision, and even postlaunch evaluations. Web site designers and developers, web site project managers, usability specialists and information architects, user interface designers, and graphic designers. "It's an incredibly good read. It rattles along at a good rate, is packed full of good advice and I had the distinct impression that here was real web usability." Xristine Faulkner, CISE, SBU. Tom Brinck is chief usability officer at Diamond Bullet Design, a firm specializing in web site design and usability consulting. Tom has M.S. degrees in computer science and cognitive psychology from Stanford University and the University of Michigan. He has done user interface research at Apple Computer, Toshiba, and Bellcore and is currently an adjunct faculty member at University of Michigan's School of Information. Darren Gergle is a Ph.D. student in human-computer interaction at Carnegie Mellon University. Before beginning his graduate work, he was lead designer at Diamond Bullet Design. Scott D. Wood is a senior scientist at Soar Technology, an R&D company focused on cognitive modeling, AI, and information visualization. He has more than ten years experience in software development, e-business consulting, cognitive modeling, and HCI. He holds a Ph.D. in computer science and engineering from the University of Michigan.